Jay Z ripped into everyone who's bashing his new business as only he can by uncorking a blistering freestyle in which he compared himself to the founders of Apple and Nike. 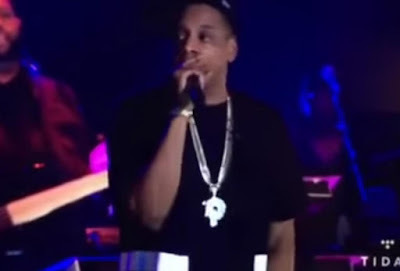 The lyrical attack came during Jay's 'B-Sides' concert last night, which aired on Tidal, his music streaming service. Critics have accused the rap mogul of charging users more for Tidal compared to similar services simply because his name is attached to it. But the highlight was his 90-second freestyle that touched on everything from TIDAL’s competitors including Spotify and YouTube to the deaths of Freddie Gray and Mike Brown, he also accuses Google and YouTube of underpaying artists. See the transcript below via Billboard. Jay Z's point? Steve Jobs was rich, and everyone bought iPhones and "Phil Knight is worth trillions, you still bought them kicks."